SFA provides customized CNC Editor Solutions for everyone, from small job shops to the largest manufacturers, with hundreds of features to improve day-to-day CNC machine tool productivity. 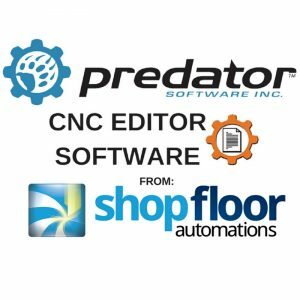 Dozens of CNC intelligent editing commands make changes to your CNC program quickly & easily. Edit confidently with the ability to undo & redo all changes. Microsoft Word-compatible menus, toolbar, & shortcut keys make these systems easy to learn with basic CNC communications. Also, Windows 10 O/S is supported! In addition, editing multiple CNC programs of unlimited file sizes at the same time, even while other applications run in the background, is supported. Cut, copy, & paste between them. Program includes a side-by-side file compare that identifies all G-code & M-code differences, then fixes them with a single click. These extremely versatile but easy-to-use packages are designed to simplify your work & will also improve productivity. Our editing & backplotter packages are developed under rigorous testing. The goal was met in 1999 when SFA was awarded the status of largest distributor of Predator Software in North America. SFA has been ranked #1 in Predator Software Sales, Service and Support for decades.